Central Vermont Medical Center strives to strengthen the health of our community and enhance the overall quality of life. You live here. So do we. Our staff, volunteers, donors, patients and physicians are your friends, family and neighbors. We think you'd agree that central Vermont is a wonderful place to live, work, and stay healthy. We have an abundance of natural resources and community spirit that contributes to the high quality of life we enjoy in our region. Central Vermont Medical Center strives to be a leader in our community by supporting and forging relationships with other organizations who are working toward our shared goals of enhancing the overall quality of life that we cherish as Vermonters. 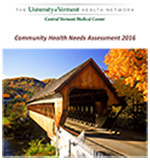 Central Vermont Medical Center conducted a Community Health Needs Assessment (CHNA) in 2012 to gain understanding of the health status of central Vermont and identify areas of need in our community. This report is used to help us better direct our efforts and resources in the community. Our Community Relations department coordinates all communications between the medical center and with the communities we are here to inform and serve. As part of our commitment to the community, we offer many classes and workshops that promote good nutrition, physical activity, and healthy lifestyle choices for Vermont adults, children, families and communities. Volunteering is a great way to stay active and to give back to your community. At CVMC we have volunteers of all ages who contribute their time, talent and energy in a variety of ways throughout the organization. The CVMC Art Gallery, located in the main lobby of the hospital, provides local artists with an ideal opportunity for exposing their work to a broader range of our community. As the hub of the wheel for regional health care delivery, CVMC works closely with other groups based in and around the region to provide a full array of health services to central Vermonters.